I've been thinking lately about the strange manifestations of creativity in my life. I started off as an artist, one of those people who doodled on everything. Yes, I even got in trouble for it in school because I would get caught up in a drawing and not pay attention! As the years went by, and college (and marriage) came along, I found myself getting away from drawing. I discovered these cool plaster figurines and began painting like a fiend. Let me tell you, everyone in my family has a few now. My favorite is a Nativity set I painted and antiqued. It's my most prized Christmas decoration. But, after going crazy with that, I moved on. I have to admit I was a scrapbooker for a while. I think everyone with a creative side tries this. It was fun, and I filled a lot of albums, but I eventually realized I was going to smother in photos if I didn't get caught up. And, well, there is just no way to get caught up when you take pictures as much as I do. Oh, yeah, there's another creative outlet! I'm not professing to be a phenomenal photographer, but I can take a darn good picture when I set my mind to it. (hee, hee, my southern side coming out in that last sentence.) I don't have the patience to learn all there is about operating a really good camera--nor the desire to tote around something that won't fit in my pocket--so that will never be a source of income for me, but I do love taking pics of my kids. And my dogs. Which brings me full circle. I've started drawing again. I've been feeling the itch ever since I started writing--not sure if that is coincidence, or if it's because writing has taken over and I no longer paint figurines or scrapbook. But I just read Duma Key (Stephen King--can't officially recommend the book--loads of foul language, but the writing is awesome) and the main character is an artist. It's what pushed me over the edge. 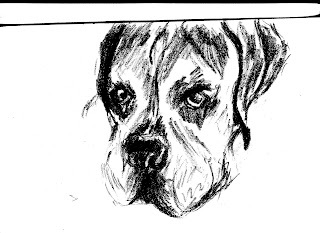 Here's my latest, just a quicky sketch of my old Boxer. He's just the cutest old thing ever. What amazed me is that I still draw in the same style I did in highschool. Like ridin' a bike! Anyway, this journey has been really cool. And it ain't anywhere near over. I love the drawing! When I set my mind to it, I can draw OK, but I so frustrated trying! That's why I LOVE photography! It's the one thing I do that I don't feel like I have to be the best, I’m fine the way I am. Plus, photography just calms me when I’m angry, and makes me happy. I'm a crafty person, but I don't think I'll ever try scrap booking. Well… I tried once, but it was too messy. Well, Lexi, your photos are awesome! You do have a talent there. Did I tell you I figured out a way to add a pegasus to the moon picture you took? I need to send that to you. Oh, and "messy" is one of the reasons I gave up scrapbooking. I had to leave my stuff out to keep myself motivated to work on it, but it adds so much clutter. I couldn't take it. Drawing is much less messy. A piece of paper and a pencil. Any time. Anywhere. Woo-hoo.